Access control and authorization are a very important part of Hyperledger Composer and the security architecture of a business network shared by member organisations on the blockchain. Hyperledger Composer enables an administrator control what resources or data a participant, or indeed participant role - is authorized to see or do, in a business network. These participants will typically operate or transact from inside their respective member organisations and each will have their own access control requirements on the ledger, whilst at the same time allowing controlled access to shared data or data that may be common to all member organisations - or specific members interacting on the same business network. This tutorial explores one such business network - the Commodity Trading network - seen elsewhere in our tutorials and sample networks and shows examples of ACLs in action in this sample network. authority to access resources or perform operations within a given business network itself (like Create, Read, Update assets), via domain specific business network ACLs. The tutorial uses the online Playground to try out some simple and conditional access rules. In doing so, you will interact with the sample network as various identities - ultimately, it is the users of the blockchain that we want to apply access control to. We'll also see how a Participant role can be used to control access, where multiple identities can be mapped to a designated Participant role (such as a Regulator). Its important to note that in a real blockchain network, all operations, whether from a Node JS application, CLI or indeed REST operations are subject to and controlled by the ACLs that govern a business network. Accountability is seen at an identity level. If you wish, you can also apply the rules in this tutorial against an existing Hyperledger Composer you've deployed. You just need to grab and deploy the sample Commodity Trading business network used in the Developer Tutorial - remembering to remove the global trading network ACL rule mentioned earlier - and you're ready to start working with that environment. We'll use the sample business network (trade-network) sourced from the Composer sample networks repository. Go to the Online Playground and if necessary clear local storage when prompted. Accept the Welcome logo, you are ready to start. Click on the Deploy a new business network modal / icon. Scroll down and click on the trade-network sample - when you scroll back up, it should populate name, description and network admin card fields for you. With the Deploy button active (confirm that the name is trade-network) - click on Deploy to deploy the business network. Lastly, click on 'Connect Now' to connect to the deployed business network (the default id - its shown top right). The 'Trade Network' README file should be active and you can see the components of the business network listed in the left column - one of these is the ACLs file permissions.acl which controls the access to resources. Out of the box, the sample business networks have 'all access' turned on, which would of course, ultimately be different to that for a production style environment. Click on the 'Test' tab near the top of the screen. This is where we create sample Trader participants. Repeat step 2 and create 5 additional Trader participants ('TRADER2' through 'TRADER6') using the sample data above (change the names as appropriate). We have provided 'TRADER2', and 'TRADER3' as an example below. Still in the 'Test' panel, create some Commodity records by selecting 'Commodity' on the left - the ownership (owner field) relates back to the 'Trader' participant for the purposes of this tutorial. Note that owner is a relationship field. Click on 'Create New' to continue. Repeat the 'Issue new ID' sequence (step 2 through 5 above) for identities tid2, tid3, tid4, tid5 and tid6 respectively, mapping these to their respective TRADER participants. Now we're ready to start creating our access control rules. Important: if you are issuing new identities for a Hyperledger Composer based environment (as opposed to the online environment), be sure to add each issued identity to your wallet using the 'Add to Wallet' option. 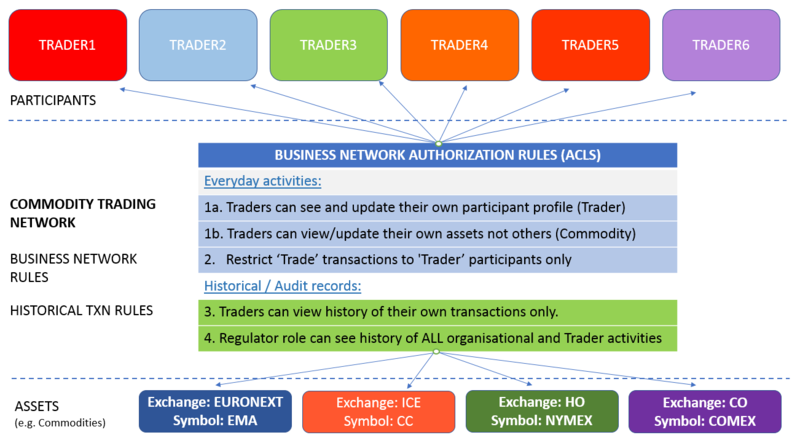 The standard 'Commodity Trade network' sample network you deployed comes with standard System and Network ACL rules, that govern the participants of the business network to enable accessing registries like asset registries or ability to reviewing historical records in the ledger. But we want to add some Trading-specific access control rules - let's start by defining what we want to achieve first ! The golden rule with ACLs is that access to resources inside a business network are by default implicitly 'DENIED' to Participants, unless explicitly ALLOWED. You will note from reviewing the current ACLs in permissions.acl that certain 'system' or 'administrator' type rules are defined in the ACLs file - this is to allow participants to be able to use Composer system operations such as being able to write to the Composer system Historian registry. Having removed this from the permissions.acl file (leaving the 'system' or 'administrator' rules behind, click on the UPDATE button (bottom left) for the changes to take effect. Ensure Traders can only see the history of transactions they have created. Allow a Participant of type REG (Regulator) the authority to see the history of all historical transactions committed by Traders (as well as working with their own participant profile) - there are two rule subsets for this - 4a and 4b. It is important to note at this point that the namespace org.example.trading (our Commodity Trading business network) has no business network ACLS defined (just has system ones) and therefore access to resources inside that business network are implicity 'denied' by default. First up - rule to restrict Traders to only see and update their own record. Confirm that you do not see any Trader records. Switch identity to the 'admin' user (top right, 'ID Registry'), then go to the 'Define' tab and click on 'Access Control' (permissions.acl) on the left. description: "Trader can see and update their own record only"
Then click on the UPDATE button on the bottom left to update the business network. This rule will allow the current Trader Participant (mapped to the current identity whether in playground (here) or indeed in your application) to READ and UPDATE their own target Trader record. TEST THE ACL: Switch user to identity tid1 (top right, 'ID Registry') and click on the 'Test' tab - check that TRADER1 record only, is visible to this identity. By default, a Trader cannot see or update any of the Commodities created earlier. We need a rule to enable a Trader access Commodities for which they are the designated 'owner'. Confirm that you do not see any Commodity records. Switch identity back to the 'admin' user (top right, 'ID Registry'), then go to the 'Define' tab and click on 'Access Control' (permissions.acl) on the left. description: "Trader can see/work with their own Commodities"
This rule will allow the current Trader Participant all operations on target Commodity resources that it 'owns'. TEST THE ACL: Switch user to identity tid1 (top right, 'ID Registry') and click on the 'Test' tab - confirm that there is one Commodity owned by TRADER1 participant and is visible/editable (icon) to this identity. Implicitly, this Trader TRADER1 has no ability to see or update other Trader's assets (Commodities) at this point - we don't need a rule for this, but there may in the real world be a business policy to allow specific senior Traders to 'see' other Commodities, albeit they are not owners for same. By default, a Trader cannot submit a Trade transaction (defined in our model and for which we have smart contract logic written in our Script file) to update a Commodity he owns. We need a rule to enable a Trader to submit Trade transactions for which they are the designated 'owner'. The Trade transaction enables the current owner to change the ownership of a Commodity to another Trader. 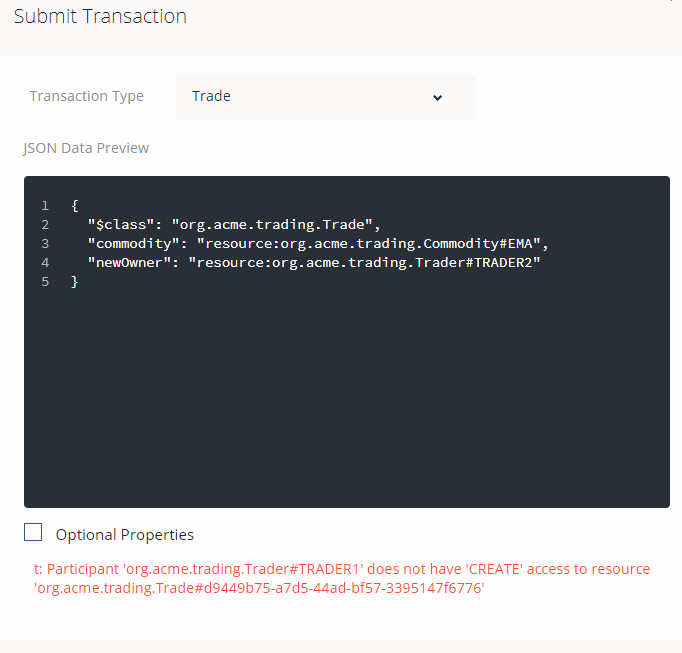 Confirm that you cannot submit a Trade transaction ('Submit Transaction' - copy and paste the transaction below) to try change the ownership of a Commodity - you will get a message that you do not have CREATE ability to do submit the transaction. description: "Enable Traders to submit transactions"
That's it. We know already that the participant can only work with their own Commodity(ies). This will allow only Trader participants to submit transactions of type Trade (we could have many different participant types in a business network). b. Confirm that the transaction has now been submitted by going to 'All Transactions' (on the left) and the first record in the Historian shows a TRADE transaction confirms the transfer. Participant TRADER1 no longer owns the commodity. By contrast, a switch to identity tid2 will reveal it has two Commodity records as TRADER2 was the recipient owner. By default, due to the System ACLs (a part of which is the registry for the Historian records), each Trader (eg. and related tid1, tid2 etc identities) can see the history of all Transactions - an example is the UpgradeBusinessNetwork performed by admin. We will lock down access to the Historian such that Traders only see transactions they submitted in Historian. Confirm that you can see transactions relating to 'system' activities, but also the other traders (TRADER1 and TRADER2). description: "Traders should be able to see the history of their own transactions only"
This rule restricts the current Trader participant to seeing only transactions he/she invoked on the blockchain. a. Switch user to identity tid3 (top right, 'ID Registry') - you will only see 'Identity Activation' type entries but nothing about the history of transactions that were submitted relating to TRADER1 and TRADER2. This is what we would expect. b. Next, switch to identity tid1 - you will see the history of transactions (including the 'TRADE' transaction submitted earlier) relating to tid1 only - in particular the transfer of Commodity 'CC' ownership to TRADER2 (By contrast, identity tid2 , the transferee, will not see the historial 'TRADE' transaction submitted by tid1 - only the Commodity asset, that was transferred). It stands to reason that a regulator would want to review/audit historical transactions carried out in the business network. They won't necessarily need access to things like Participants or Assets per se (depending on the use case or policy), but rather, the activities relating to these. We don't yet have a 'Regulator' in our 'Commodity Trading' business network model, so we will add this as a separate participant type and then proceed to define rules that allow someone that has the regulator 'role', to access historical records. Remember that one or more identities can be mapped to a participant instance, and 'Regulator' is a good example of that. Ensure you click on the UPDATE button to update the network. Create an Identity in the ID registry for an identity with ID 101 and map it to the Participant regulator 'Reg101' created above. At this point, the Regulator can now see the history of system transactions in Composer's Historian, due to the system ACL rules defined earlier. But at this point, he cannot see his own participant profile. description: "Regulators can see and update their own record"
This rule merely allows a Regulator participant to update their own profile record (should they wish to update it - you can test this out if you wish; we had done something similar earlier). Then click on the UPDATE button on the bottom left to update the business network with the new rule. Check you can indeed see the Historical records (which shows our previous transactions - then click on 'view record' for any system type transaction activity such as AddAsset or AddParticipant - as someone that is a Regulator, you should be able to see this activity. Switch identity back to 'admin' as good practice for rule changes. description: "Grant Regulator full access to Trade Transactions"
This rule enables a Regulator to access the Trade transaction resources, such that it can view the Trade transactions from Historian's 'view record'). This rule also applies to any subsequent identity mapped to the regulator role and in the Regulator participant registry. In this tutorial, you have experimented with creating ACL rules incrementally, only permitting the requisite access controls that should be accorded to participants of this example Commodity Trading business network. We have seen how ACL rules provide authorisation and access control to resources as applied to participants (or indeed participant roles). ACLs govern the access control to resources and transactions, whether that's the ability to create, delete or update resources or execute transactions. We have also the power of the Access Control Language and rules, in defining the conditions or criteria as to: 'who' has the ability to do 'what' on the ledger.